Recently, I read an article on a food news site in which someone was extolling the virtues of monaka. The notion of the ice cream encased in the cone rather than heaped on top of it was just too exciting for them. It's as if the writer felt the Japanese had done something truly remarkable. The problem is that no one cares that much for a cake cone, and monaka are the equivalent of cake cones bricking up your precious ice cream. They're edible Styrofoam packaging with little flavor and a less than appealing texture. And I have to say that cake cones in the U.S. are actually better than the monaka coverings I experienced in Japan. That's probably because they aren't being sold with the ice cream already in them where it can leech moisture into the cone over time as the hapless confection sits in the freezer waiting for someone to find it appealing enough to buy. I'm not saying monaka were never good. 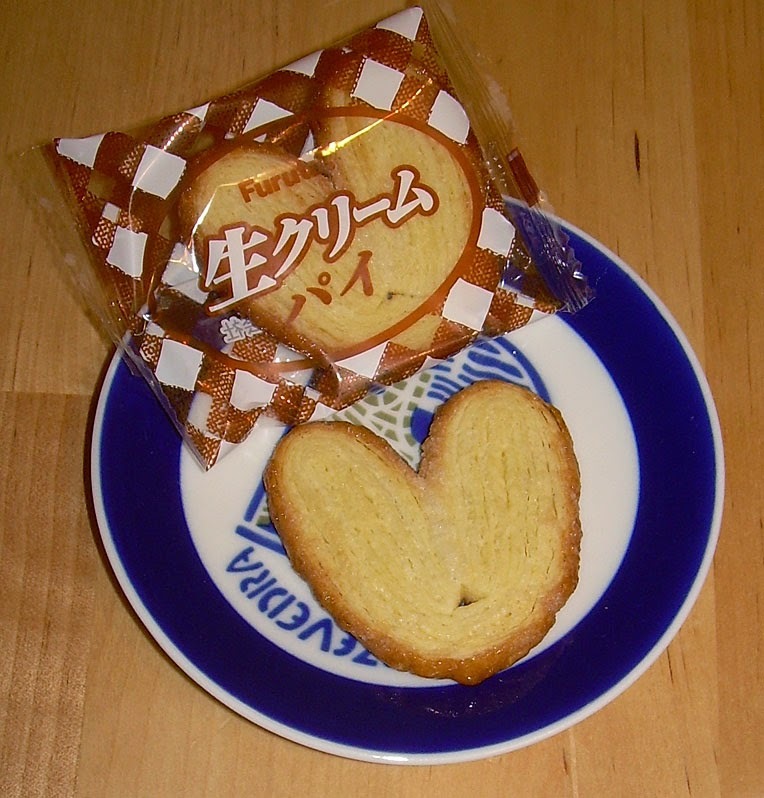 I found the Jumbo Morinaga one quite appealing, but that was more about the filling than the "wafers" that encased it. My point is that they don't taste like much, but that actually suits Japanese tastes pretty well. In fact, in my experience, the Japanese love things that are on the bland side. It's why I so often heard students complain about food in the U.S. being too sweet or too spicy. Note that they rarely said it was "too salty", but that would be a bit too ironic coming from the land of soy sauce. When I buy any snacks from Japan, I keep in mind that their tastes are different. A lot of the time, I have to look for subtlety and texture rather than strong tastes. When things are good, there is flavor depth which reveals itself in the absence of a high amount of sugar or spices. When things are not so good, well, it's rarely actually bad, but is something I tend to be indifferent toward. In general, one of the more popular types of crispy cookie-like snacks that falls into the "indifferent" category are these "pies". When they say "pie", don't think "Hostess fruit pie", think "pie crust". That's my way of saying not to expect a lot of sophisticated flavor. The cookies smell of margarine which is desperately trying to convince someone that it is actually butter with a faint hint of coconut. The strange thing is that coconut is nowhere in the ingredients, so it must be some sort of olfactory hallucination. The cookies are about half the size of my palm. Each is 48 calories. The flavor of these is definitely on the muted side. They are lightly sweet with the fake butter and fried flour being the outstanding flavors. Each is light and flaky and like layers of concentric pie dough. There's not a whole lot going on in the front end, but there's a back end flavor which is very reminiscent of the edge of the crust on a pumpkin pie. Most of what you're getting from these is texture, not taste and there's very little in the way of depth. These are a snack that cries out for some sort of addition, whether it's a little jam, a side of cream, or a cup of tea or coffee. These aren't bad at all. In fact, I think they'd go over well as a garnish on ice cream or even used as a heart-shaped decoration on the side of a frosted cake. In fact, they'd be ideal for the latter since they add a textural contrast and could match nearly any flavor of frosting or cake. At $1.50 (150 yen) per package for 7 "pies" (at least at Daiso), it also wouldn't break the bank to buy them. 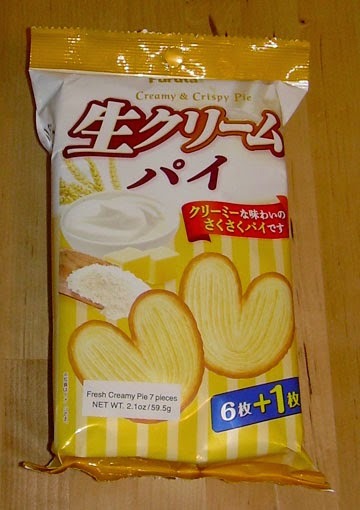 Mainly, however, these are for people who want a variation from the tea time butter cookie and really aren't much of a taste event. If yes, people from the Continent (France, UK, etc) would know what it is... pretty sure this is the same (or similar).